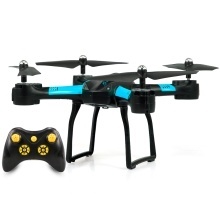 This YILE TOYS S31 drone is a basic training drone for new beginners. It features with altitude hold, 3D flip, headless mode, one key takeoff/landing functions. If you are willing to practice your drone operation skills, come on and get one. You&apos;ll love it! High/low speed switch: suitable for RC professionals and new beginners. Almost 25 minutes&apos; long term flying time gives you a more thrill experience. One key return: the drone can find its way back home when pressing one key return button on controller. * Don&apos;t over-charge, or over-discharge batteries. Don&apos;t put it beside the high temperature condition. Don&apos;t throw it into fire.Don&apos;t throw it into water. * There could be some deviations due to manual measurement or slight color difference owing to photographing condition. Thank you for your understand.